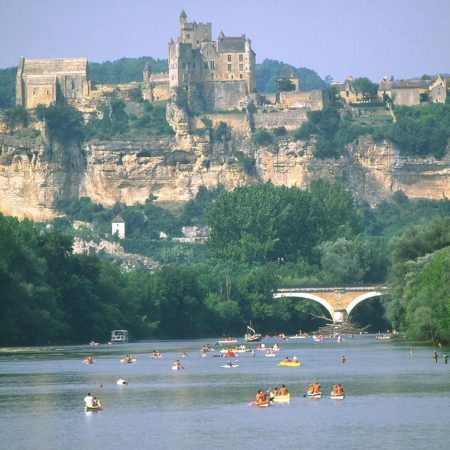 15km from the campsite, discover the Château de Castelnaud, Périgord Noir’s main site and visit the museum of war in the Middle Ages. 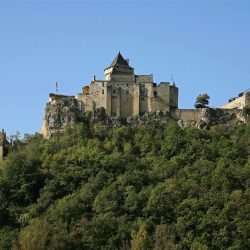 Built in the 12th century on a rocky outcrop, the castle dominates the Dordogne valley and offers a very beautiful panorama of the sites of Beynac, Marqueyssac and the Roque Gageac. Strategic site during the war of 100 years, the castle will pass constantly from one camp to another. It will be abandoned during the Revolution and will therefore continue to deteriorate. It will even serve as a stone quarry in the 19th century. It will be classified as a historical monument in 1966 and will be renovated later. Inaugurated in 1985 and installed in the rooms of the seigniorial lodge, the museum of the war in the Middle Ages of Castelnaud exposes a collection of 200 pieces of weapons (weapons of jet, knives, artillery pieces ) and armor. 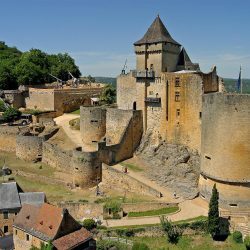 After your discovery of the castle, take a walk in the village of Castelnaud-La-Chapelle labeled More Beautiful Village of France </ em> for its typical Perigordian habitat.